Fort Irwin provides realistic joint and combined arms training focused on developing Soldiers, leaders, and units of America's Army for success on the 21st century battlefield. 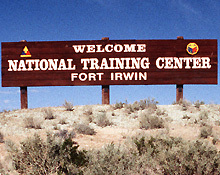 Fort Irwin is located approximately 37 miles northeast of Barstow, California midway between Las Vegas, Nevada and Los Angeles, California. The High Mojave Desert's hills and mountains surround the installation. Beautiful sunsets, blue skies, sunny days and wide-open vistas are some of the pleasures of the desert that give many a sense of freedom. However, expect the primary colors to be tan and brown.